Choose the size where your waist measurements falls. TopVintage model: Kim (1,80m), wears size S.
New - limited - collection! 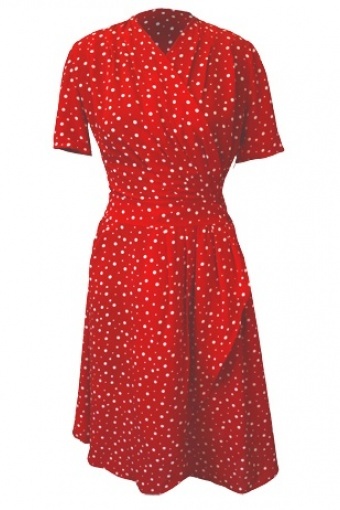 The 40s Abeni Polka dot red wrap dress from the swedish designer Miss Candyfloss. Cute and playful 40s inspired retro dress. Made of semi sheer crepe fabric which gives the dress a beautiful flow. It can be adjusted on the sides for a perfect fit. If you're looking for the perfect casual-yet-cute dress, look no further! It is as comfortable as it is cute! Oorbellen (in vorm van strikjes) super schattig en ook de ketting van from Paris with love is helemaal geslaagd. Nu sparen voor een volgende aankoop!